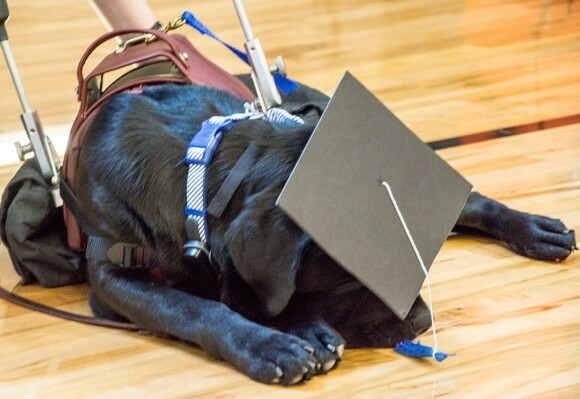 On Sunday, June 25, 10 full service and 6 home companion teams graduated from Canine Partners for Life. We also celebrated 3 breeding program dogs who had their first litters of puppies for CPL. Graduation is a celebration of our newest teams and an opportunity to honor all the volunteers and donors who helped make these partnerships possible. These dogs have already started to change the lives of their partners. Nathan is able to sleep in his own room because Rafter, his home companion dog, sleeps with him, giving him security and companionship. Marsha is able to walk up and down stairs with Hughie and no longer needs the assistance of another person. Naomi is excited for her future because with Chadds, she has the ability to attend college on her own. These teams have already made huge strides in such a short period of time and we can’t wait to celebrate all they are able to achieve over the next several years. A special thank you to all of our supporters who helped make these partnerships possible.